Significant confusion and a high level of fragmentation can be expected over the next five years as European financial institutions become accustomed to new regulations under the Payment Services Directive (PSD2) which will open the door to new competition within the European payment services market, says Nordea Bank’s vice president of strategic business development, transaction banking and business innovation. PSD2 will require banks to adopt a “totally new way of viewing their customer base,” Liisa Kanniainen tells readers in an in-depth paper now available to download from the NFC World Knowledge Centre, before explaining why banks are better positioned than new market entrants to continue providing payment services because of their existing customer base, payments market knowledge, reliability and compliance. 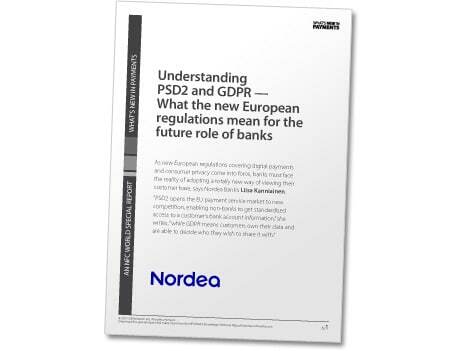 Simplification, open banking and a mix of its own developments as well as partnerships will be the key strategies for Nordea in ensuring it meets future customer needs under the new regulations, Kanniainen explains in ‘Understanding PSD2 and GDPR — What the new European regulations mean for the future role of banks’. “There are a lot of things happening in the payments space,” she explains. “Real-time is happening. Contactless is happening. Blockchain is going to happen. Biometrics is another key technology. Just a few years ago, making payments involved letters, faxes, phone calls or face-to-face interactions with banks. 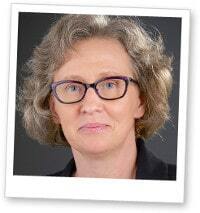 Readers can download Kanniainen’s 10-page paper, which provides a wealth of insight into both PSD2 and the General Data Protection Regulation (GDPR), free of charge from the NFC World Knowledge Centre. We will see some security failures and some fraud as competitors roll out offerings and consumers learn to us them. However, anything that reduces the use of credit card numbers can make us more secure.